I may not have cared much for Doctor Smith (Parker Posey), but any time she wore a hood my opinion of her improved 1000%. 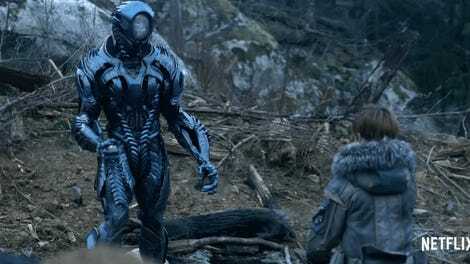 Now that we’ve all had a weekend to chow down on Netflix’s new scifi series, Lost in Space, it’s time to sit down and have a spoiler-fueled chat. No space monkeys, no creepy spiders. Just you, me, and a weird alien robot. We’ve already given our take on the scifi reboot (imperfect but promising), but now it’s time to hear what you have to say. I’m especially eager to chat with y’all about Doctor Smith (Parker Posey), as I have some opinions. Below are a few of my spoilery thoughts that I couldn’t share in my review. Let’s get lost in space thoughts, shall we? It took way too long for the show to give Parker Posey a decent hairstyle. Also there’s some alien tech. • Having the robot be the cause of the space station’s destruction was great—and I’ve been wanting to talk about it so badly. It reminded me of when Doctor Smith sabotaged the robot in the 1997 movie, only on a much bigger scale. And then when we found out why the robot did it, it became even more awesome. • I wanted to love Doctor Smith, as Posey is one of my favorite actors, but I couldn’t get behind her new backstory and how it motivated her actions. In the original series and 1997 movie, Dr. Smith was a spy scheming to bring down the Robinsons’ mission, which gave both the series and movie some weight and tension. Here, she’s a stowaway with a criminal past. That’s... not enough. Granted, I have no issue with them changing things up—I thought making her a therapist was a stroke of genius—but all her scheming and conniving didn’t match with a simple survival story. Maybe there’s more to come? But that doesn’t seem likely. • Judy shouldn’t have sacrificed the fuel to save that one guy. That was stupid. It doesn’t matter if the guy lived or not (he did not), but Judy was trained for the mission and she should’ve been smart enough to know you don’t sacrifice thousands of lives for one person. That was probably my least-favorite thing that happened this season. Apart from alien poop. • The ending was something else (and I’ll be writing something special about it this week). Robot-on-robot fighting, Will’s daring space walk, learning the truth about how humans stole alien technology to make their space station. Then... that cliffhanger ending, where the alien technology fused with their ship (getting rid of that pesky gravity problem) and made the Robinsons actually get lost in space. The last episode was probably my favorite—alien creature poop notwithstanding—and it made me psyched about where things will go next. Those were some of my thoughts, what about yours?